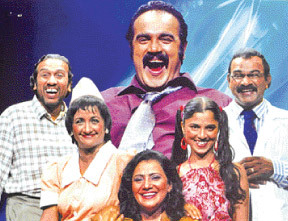 Gabbara Minisa (Pregnant Man), the latest comic stage drama of well versed film, television and stage drama actor Sriyantha Mendis, will have its special show on September 3 at 3.30 and 6.45 p.m. at Borella Namel Malani Punchi Theatre with a host of popular actors such as, Sriyantha Mendis, Kusum Renu, Sarath Kothalawala, Wasantha Vittachchi, Malkanthi Jayasinghe, Sujeewa Priyalal, Mihiri Priyangani along with many more artists performing in it. Music by professional music director Anthony Surendra while popular Derana Dream Star Upeka Nirmani will brighten up the drama with her singing. This drama will be choreographed by senior lecturer Ariyarathne Kaluaarachchi. Polished with Wasantha Vittachchi’s make-up and Nipuni Mendis’s costume designs, stage lighting will be by Upali Weerasinghe, stage management of “Gabbara Minisa” (Pregnant Man) is done by Himashi Vithanage and Sameera Hettiarachchi with the assistance of Neil Ravindra, stage settings by Luvolin Vandawall and still pictures by Hiran Costa. Gabbara Minisa (Pregnant Man) is an adoption of Ajith Mendis from the book written by W.S. Wijesinghe. This drama will be presented and organized by Jude Srimal.